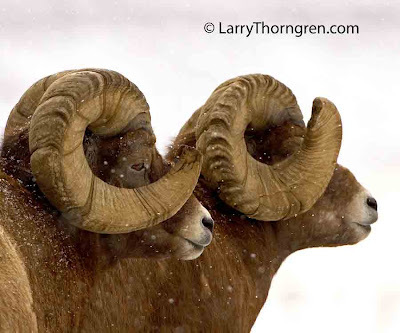 This is how Bighorn Rams look in herds that are protected from hunting. They didn't get shot when they were young. These rams live in an area that has no domestic livestock to compete with them for food and no domestic sheep to give them disease. Compare this photo to the ram in the previous photo in Wyoming, where the rams get hunted every year. When hunters continually kill the largest rams in a herd, the small rams breed the ewes and gradually a smaller horned population of Bighorn Sheep is produced. What fantastic photos. But don't praise Canadians too much we do just as many stupid things. Take a look sometime at the Black Bear hunt in Ontario. The bears are baited; some jerk, guided by an equal moron, sits in a tree stand with a rifle or a compound bow and shoots the bear. Some sport!!! Boom & Gary of The Vermillon River.